We have a strong passion for helping expecting moms and babies live a healthy, amazing life. Please read below for additional information, if you have any questions please let us know! We get all kinds of excited when we see a baby bump come waddling in our doors! Why? Because we know when ladies get chiropractic care during pregnancy from someone who specializes in this area they experience a more pleasant pregnancy, optimal fetal positioning, fewer issues, and faster delivery times! Pregnancy is a beautiful time in a mothers life, it shouldn't be painful! We offer moms specific, gentle adjusting, exercises, and home recommendations to make their pregnancy and delivery the beautiful process it should be. Dr. Mitchell has taken numerous prenatal seminars and is certified in Webster technique. ​The Webster technique is a specific chiropractic analysis and diversified adjustment. The goal of the adjustment is to reduce the effects of sacral subluxation. In so doing neuro-biomechanical function in the pelvis is improved. Babies seeing a chiropractor, are you crazy?! Babies are fragile! Fortunately, we do not treat babies the same as adults! The entire experience is different, gentle, loving, and very effective. But why would I need to bring my baby to Dr. Mitchell? Unfortunately, there is often trauma associated with the birth process that creates issues within the newborns little body and a specially trained chiropractor is the perfect person for the job. What issues might we address? Chiropractic/cranial care can assist with alleviating infant colic, nursing issues, gas, fussiness, recurring sickness, as well as easing or eliminating plagiocephaly (flat head syndrome) or other cranial issues. Its not uncommon for newborns to be seen even though they aren't exhibiting problems. Who else checks a newborns spine? What if something is missed or misdiagnosed by not having your baby checked? All chiropractors learn about pediatrics in chiropractic school but few really specialize. 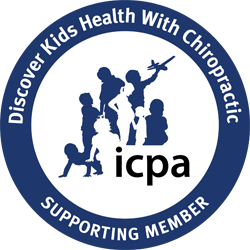 Dr. Mitchell is a member of the International Chiropractic Pediatric Association, and has spent a lot of hours taking postgraduate courses in chiropractic pediatrics and cranial therapy and continues to grow his knowledge in this area.